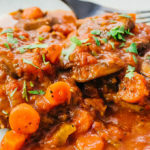 Instant Pot Swiss Steak with mushrooms and a rich tomato sauce. Low carb, keto, and gluten free. Trim the beef of any excess fat, and cut into 8 to 10 slices about 1/2 inch thick. Pat dry with paper towels. In a small bowl, combine all dry seasonings and stir to mix well. Add sliced beef and all seasonings to a resealable bag. Toss until the beef is well-coated. Select the saute mode on the pressure cooker for medium heat. Add olive oil to coat the bottom of the pot. When the display reads HOT, working in multiple batches, add beef in a single layer and brown for about a minute, flip to brown the other side for another minute, then transfer to a large bowl. Add onions, carrots, celery, and garlic to the pot. Cook for a few minutes to soften, stirring frequently. Turn off the saute mode. Add diced tomatoes (including liquid in the can) and Worcestershire sauce. Stir together until well-mixed, scraping up flavorful brown bits stuck to the pot. Return the beef slices sans drippings to the pot, snugly arranging the beef on top of the vegetables. Evenly distribute mushrooms on top. Secure and seal the lid. Cook for 30 minutes at high pressure, followed by a 10 minute natural release. Manually release remaining pressure. Uncover and transfer only the beef slices onto serving plates. Turn on the saute mode. Boil for about 20 minutes or until the remaining liquid thickens into a sauce, stirring occasionally. Turn off the saute mode. Pour the sauce over the beef slices. Top with parsley and serve.